Send me my guide & VW Camper Hire offers. Do not send me further VW Camper Hire offers/updates. 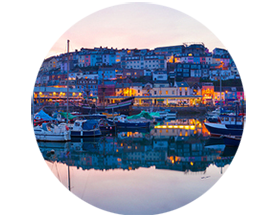 Looking for a mini break or weekend escape? Our New Forest campervan hire experience is exactly what you need to get away from the pressures of daily life and go back to basics. There’s nothing better than having the freedom to explore the stunning surroundings at your own pace and set your own schedule. Located near Southampton, the New Forest is a beautiful part of the UK. 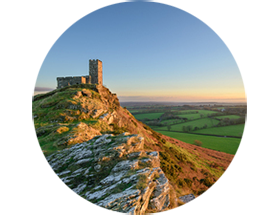 As the country's most ancient forest, it has a rich heritage to offer plus amazing food and drink. Book a weekend, mid-week or week-long adventure today! Plan your VW campervan road trip experience around the New Forest and Hampshire, plus the surrounding counties with unlimited mileage. From historic towns such as Lyndhurst and beautiful coastal villages such as Lymington, the New Forest has plenty of attractions and activities to keep you busy. You’ll find stunning forest walks, cycle trails, boat yards and the world famous Beaulieu Motor Museum and Paultons Park with Peppa Pig World. 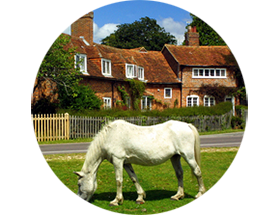 The New Forest is a mixture of woodland pasture, heaths, coastline and dense forest. Originally a Royal designated hunting ground, today it’s grazed by wild ponies, cattle and pigs. Hampshire's New Forest is a very diverse environment forest with a rich history. The national park is substantial in size and you can walk for amazing mile after mile without seeing another person. The New Forest is the perfect place for families, offering attractions for grown-ups and kids. With so much choice available, you’ll find plenty to do whether you want a more adventurous holiday or you’re just looking to relax. Take in the breath-taking scenery on walks or bike rides, visit the surrounding wildlife or even tour the forest on horseback. As many of our campervans are pet friendly, you can bring your dog along for the adventure as well. Booking your New Forest campervan trip with us couldn’t be simpler, and the forest is easily accessible from our Southampton depot. Travelling to Southampton from the rest of the UK is a doddle too. We’re based just 1 mile away from Southampton Central station and 4 miles away from Southampton Airport. You can also reach us via the M3 and M27 motorways. Easy peasy! You can rest assured that we keep our vans in tip-top condition so you’re cosy throughout your trip. Complete with comfortable interiors and the basic mod-cons you’ll need on the road, you won’t be left without the essentials. Choose from various models, such as Splitscreens like Monty, Bays like Ruby and Californias like Dexter. If you’re travelling as a twosome or as a family, we’ve got a van to suit your needs. Book your trip today and experience everything the New Forest has to offer. At VW Camper Hire we believe we are not just providing a vehicle hire - its more than that - its a unique and special experience that we really want you to enjoy! So we do as much as we can to cater for all your needs to make sure you get the adventure you deserve! 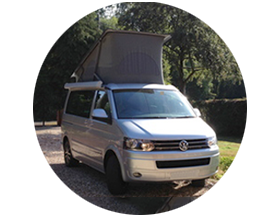 With two bases - one in Southampton, Hampshire and the other in Sidmouth, Devon we are perfectly place to offer perfect VW Campervan holidays! We have a spectaular fleet of campervans with a choice of classic, retro and modern luxury campervans. We don't believe that left hand drive vehicles provide a great experience in the UK so you won't find a single left hand drive campervan on our fleet! You literally need to turn up with your clothes and bedding and off you go! Included is crockery, cutlery, utensils, gas plus all the other camping items for a perfect trip! All the campers have been updated to a modern luxury standard and feature iPod & iphone connections along with everything else you would expect as standard. You are covered with self drive hire insurance and full AA breakdown cover plus 24hr support from VW Camper Hire! If needed we can accomodate Sunday drop offs to suit your needs. We believe you should know exactly what you'll pay, before you commit so you'll never get charged any hidden charages and all prices are clearly marked out when booking. FREE Parking space for each booking in our car park.